The next element to discuss is broadly understood living conditions - place (and decor) of their respective residences and/or workplaces, the role it played in their activity and stuff like that. 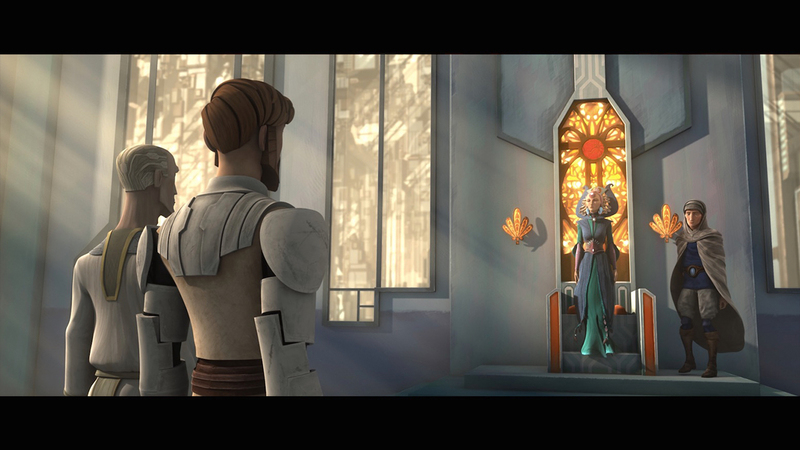 I already mentioned few times that Satine has her own palace on Mandalore. I highly doubt it was specially built just for her. She may live in official resident for the current ruler or even in estate that belonged to her family for some time already. It’s hard to tell, but one thing is most likely sure - she considered palace to be her own place (”I told senator Amidala that Mandalore was not part of the war, yet here I find a battle in my own palace“, s03e05) what I personally think is more about feeling of belonging here & having control than material (and political?) aspect of having representative residence. 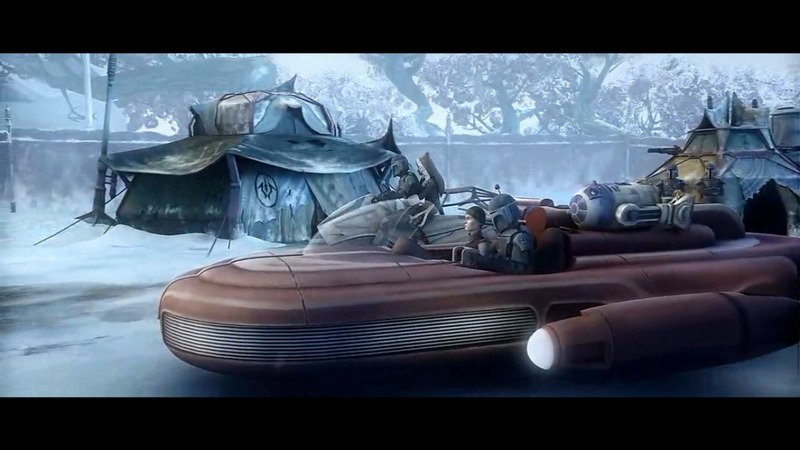 – but also is spending time with her friend(s) like in the dining scene with Padme seen in already mentioned episode. 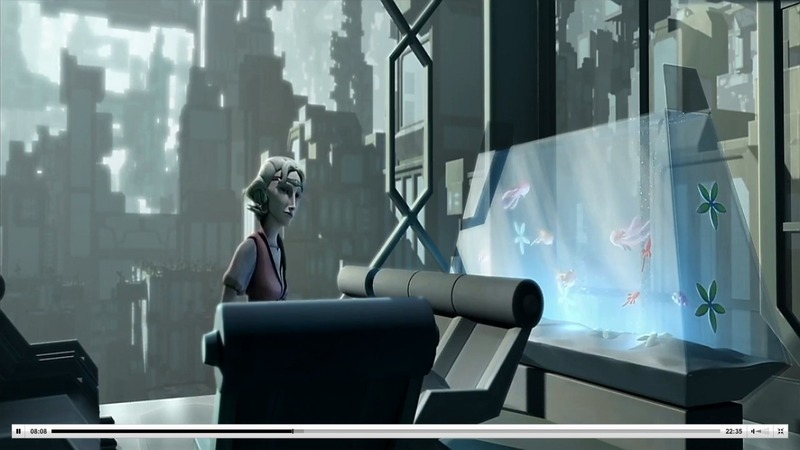 So I assume Satine’s palace plays role of her workplace and living space on daily basis. 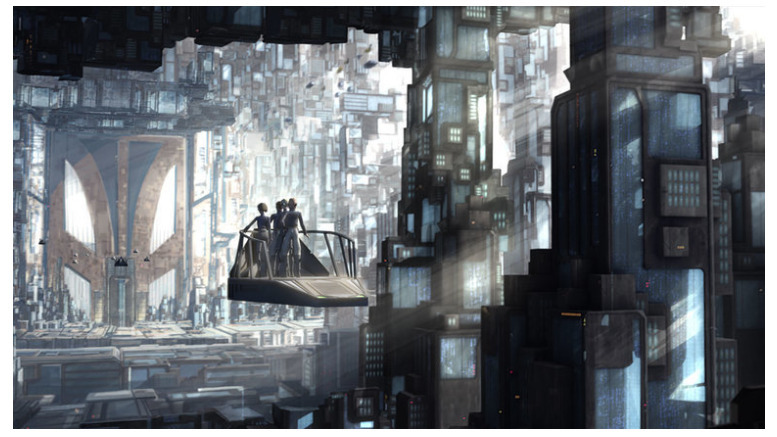 Basing on these few examples, Satine’s palace is spacious yet lacks personal accents and in general seems bare. The painting of Duchess and her throne (more flower-detailed?) are two standing out elements. The localization is also an important detail. For the record, Mandalore planet as a whole is mainly covered by white-sand desert thanks to Jedi/Republic attack ~700 years ago. The area around Sundari is a bare land, while people are forced(?) to live in city under black-ish dome. Not sure why they need the dome nor how it’s supposed working, but frankly, looking at topography of this place, I think Mandalorian people may be cut from natural light, especially those living in lower levels - what may explain why New Mandalorians tends to have lighter tone of skin and hair, if people from generation to generation lived in such enclosed, cut off from natural sunlights space. No contact with sun means at least really limited skin pigmentation (what alone is not excuse for their lack of ethnic diversity, just to be clear here). Inside the city, the space is heavily built-up. What gives impression that access to “natural” light is limited by dome itself and to some degree by high buildings & the buildings merged(?) with the outer shell of the dome. Because of that I think that Sundari is similar to Coruscant in the aspect of access (privilege) to light. People from lover levels are less likely to have it. It shouldn’t be surprise then that Royal Palace is located in central part of Sundari. A part that seems to basking in sunlight and is situated close to greenery (Peace Park). Trees alone, due to living conditions and the destroyed ecosystem aren’t so common either. The light and trees are more likely the exclusive goods in heavily built-up, limited space. a building we don’t know anything about; do people need any permit to get inside? Are they checked at the entrance or it is one more public space the TCW show didn’t focus at all? In general I think that Satine’s display of wealth more often than not is a tool in ruthless political game. Looking at her palace - the workplace and dwelling-place - the huge building complex is spacious yet almost bare. 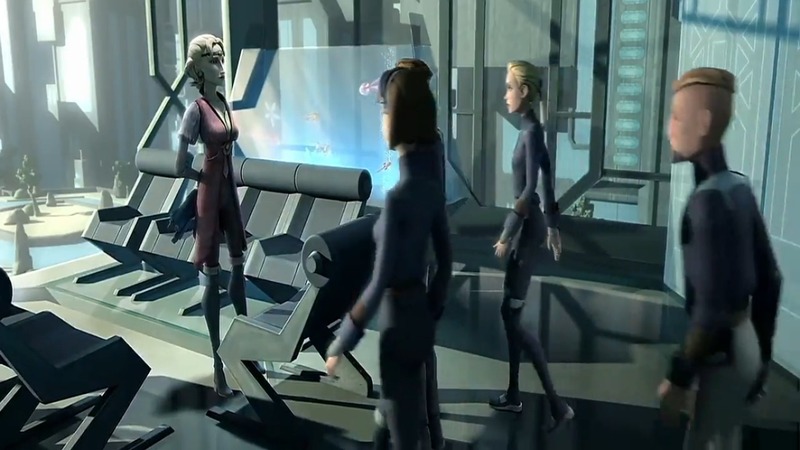 In contrast to her clothes with visible elements from her homeworld, the place itself does not tell us much about who Satine really is as a person. In my opinion the lack of luxury in palace may be not about what she can or cannot afford and more she really doesn’t need - or does not want - it. Adding to that the simple, minimal fashion sense of native Mandalorians, the interior of the palace does not depart from interiors of other buildings seen in the show and fits the commonly accepted norms(?) on Mandalore. To some degree, I also think the bare inside of Royal Palace may comes from Satine’s nostalgia - in youth, she spent a year running away from enemies with Jedi at her side. During that time Satine was forced to endure hardship (uncertainty of next day, fighting for survival, eating was what hunted by them). It was a dangerous year but also a time in which she fell in love with Kenobi and period that shaped her anti-war beliefs. Maybe she doesn’t want luxury, to keep herself remind of the war time (the hardship) and that work for peace does not end still? To not be deceive by Arassum, the Mandalorian old deity that drag people down into stagnation and idle consumption, thus make them complacency? Satine herself is aware that there is still a lot to do to change Mandalorians for better, still many who resent her and pacifist ways. In that context, the modest interior of Palace actually adds something positive to the perception of her character. Unless the lack of visible luxury (especially lack of elements related to her native culture) is just a way to not reinforce people aversion to her rule, to not interfere with accepted norms (fashion sense? spirituality not directed at material goods?) but for now I’m gonna stick rather with Satine’s own beliefs / humility / religious feeling than stricte political ruthless. At the end of final Mandalore Arc, Satine was jailed, but since it wasn’t her choice of living conditions, I’m skipping that part for another time. Governor Vizsla, as far as we could see, lived & worked in similar but not completely the same conditions. His official residence was part of Concordian government building but since he wasn’t part of any royal family - at least in terms of New Mandalorian society because Vizsla family alone was one of the oldest Mandalorian clans. 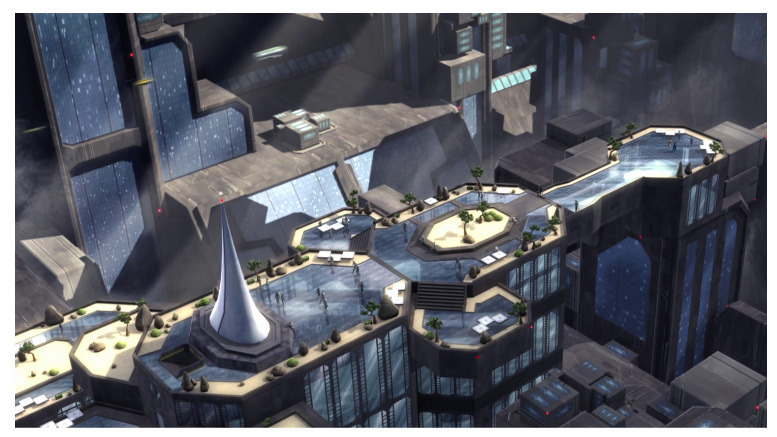 We know from TCW Visual Guide: New Battlefronts that Pre somehow has risen to become the governor of Concordia, thus I think his quarter was always meant to be temporary place. To be fair, I don’t think there is any info how Concordian government works really, but I suspect governor alone is not hereditary title. 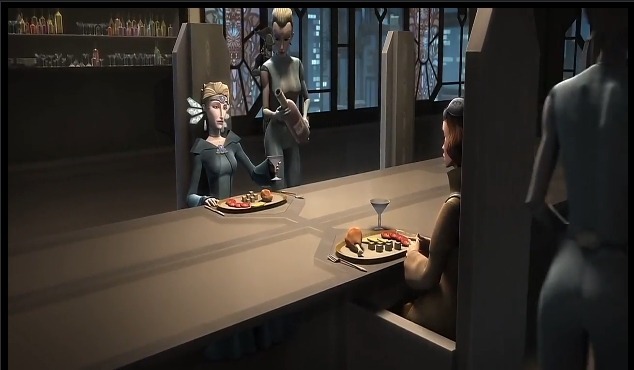 TCW never showed much of Vizsla’s residence (or in general, Concordian government complex) beside one room that as dining place(?) is not something I would call exactly Pre’s private chamber. A room that beside three elements (four, if we count the alone glass on table), looks pretty much impersonally. Similar to Satine’s own palace, the place seems empty to some degree. The most visible personal(?) accents are: bar alcohol, something I don’t have an idea what it supposed to be in left corner (a plant or sculpture?) and of course, the painting. Death Watch had its hideout on Concordia close to mines. Metal barracks are the most distinctive elements of the whole structure. Due to Pre’s undercover mission, I’m doubt he was capable of living there for longer time periods. or living (traveling) aboard on Gauntlet, his personal Kom'rk-class fighter/transport. 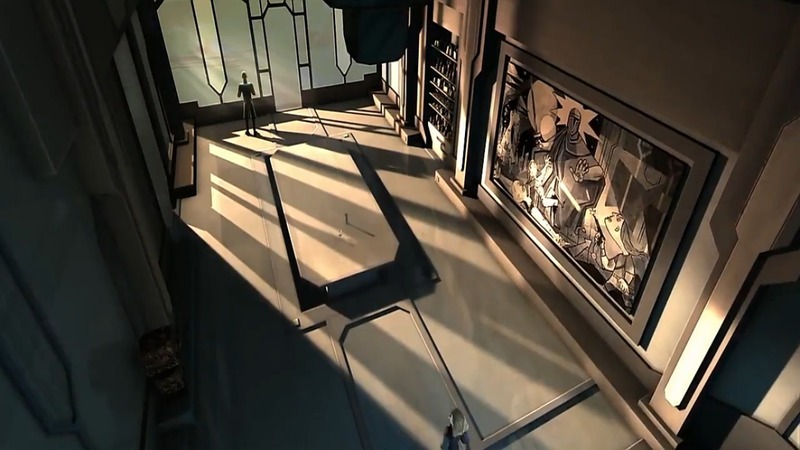 Those new living conditions are more spartan-like but frankly, even before I wouldn’t say that Pre (and to some degree Satine as well) lived in any special luxury from what was showed. The most visible difference is that Concordian architecture - similar to the one seen on Mandalore - provide space while high and wide windows give natural light & nice views. 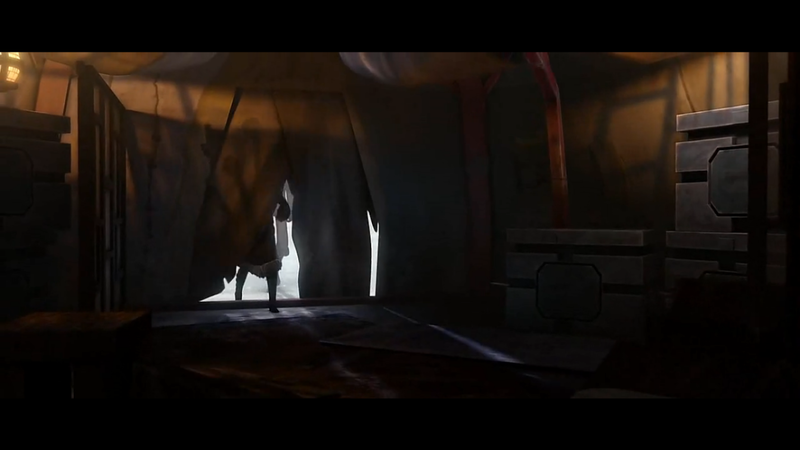 In all fairness, I’m not so sure, if tent in which Ahsoka and Lux were supposed to meet Pre [”Friend in Need] was intended only for him or did he share it with someone’s else - maybe Bo, his most trusted lieutenant? It’s hard to tell, since A) inside of the tent was only partially shown and B) we don’t know in what conditions lived other warriors. A lot of free space was occupied by metal(?) boxes, probably with supplies or other equipment. Boxes alone were separated by screens from the rest of living space. The pair of seats on which Pre and Lux sit down (and maybe low table(?) on which helmet was laid on) were the only visible furniture. Other interesting elements are lamps since inferior of tent had limited access to natural light and carpets / rugs on the ground which are most likely put there for additional isolation from cold. Not much there to talk, practicality over comfort. Of course, the fireplace may be just there for cooking alone, something that terrorized women were forced to do - but from a practical point of view, the closer to the diner (common) room the better for cooking. Unless, Carlac women lived in designated part in common tent or somehow really close to the common tent/kitchen? 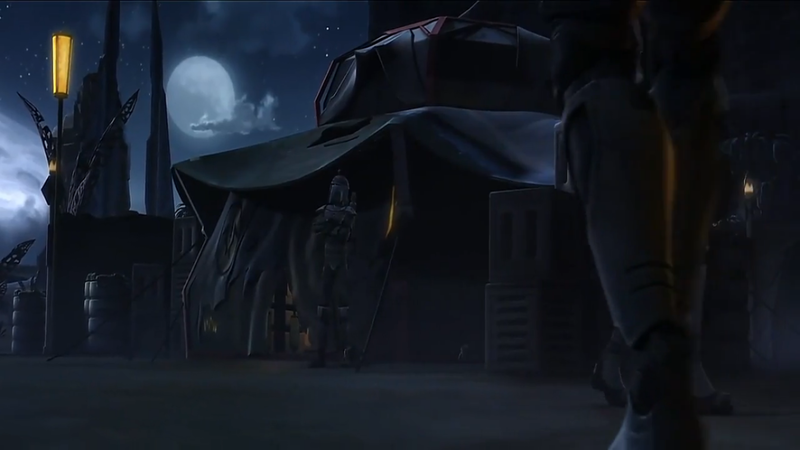 In Death Watch’s two camps seen in The Clone Wars, the common tent serve as the most important place. That was on placet Carlac and on the moon Zanbar, where Death Watch took half-dead Maul and Savage. When Maul get better, he was taken to Pre Vizsla. This time the inferior of tent was showed in more detailed way albeit I’m unable to say for sure if that place was meant for Pre’s exclusive use. Similar to camp on Carlac, metal boxes were stored there and apparently used as additional seats & tables. 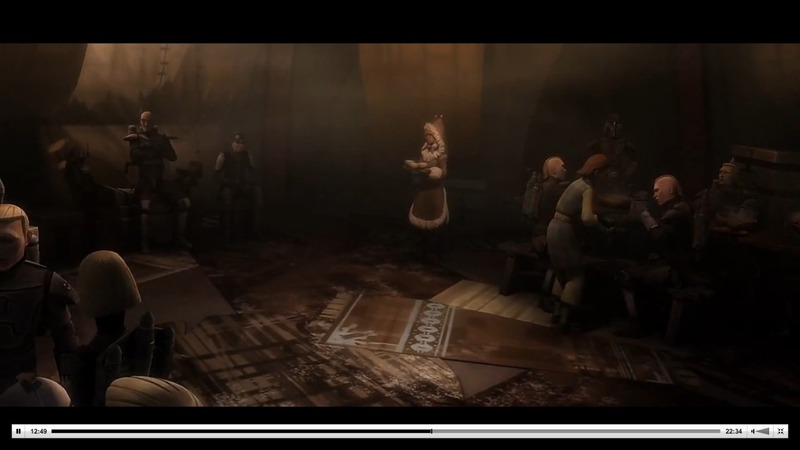 Beside screens, in Pre’s tent were put also wooden table and benches what implies it’s normal thing for other warriors to occupy space here, most likely even not in the official duties (man at table for example is drinking/eating, while others are talking to each other). Of course, there is a chance that all gathered there Mandalorians waited for Maul to show up - Pre for sure was aware that sooner or later the unknown Zabrak warrior is gonna pay him a visit. 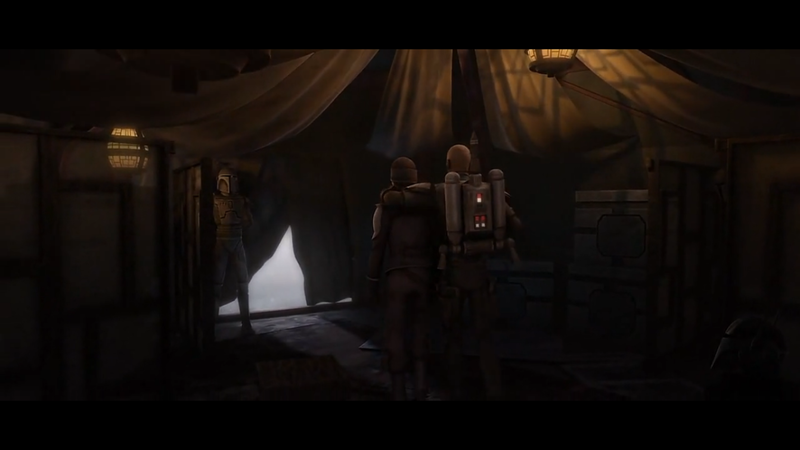 Vizsla waiting in his own tent makes sense - it was already his territory, he was backed up by his own men and that alone makes it easier to keep negotiation on pro-Mandalorian terms. Vizsla was a leader, yet the occupied by him tent was close to entrance to the camp. Which I think isn’t the safest nor the most important localization for someone of his rank. Then again, Mandalorian warriors don’t always follow “common logic” of “normal” citizens. Backing to main subject, once again Pre’s tent did not have any luxury items. When Sith came in, he was offered a tea and a seat at table. That way, Maul and Pre talked as (more or less) an equal men. 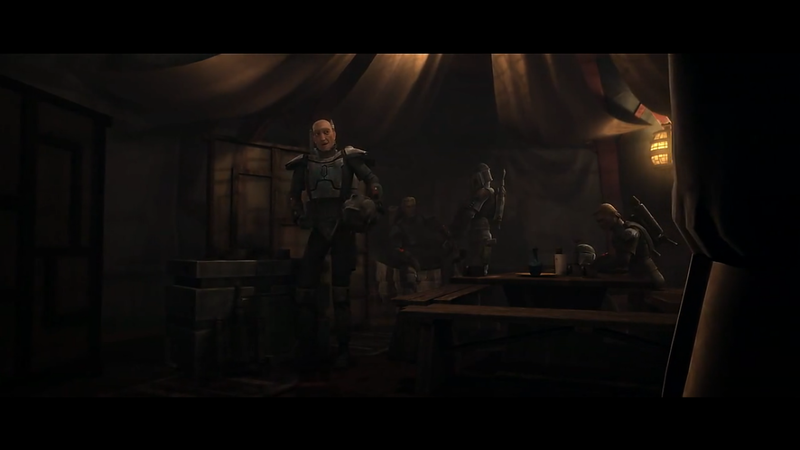 When offer of alliance became an option, instead of making decision by himself, Pre sent away Maul, so the Mandalorians could put it to a vote. The vote alone wasn’t include in the show, but most likely happened not in Pre’s but in common tent, since it was the most important part of the camp. 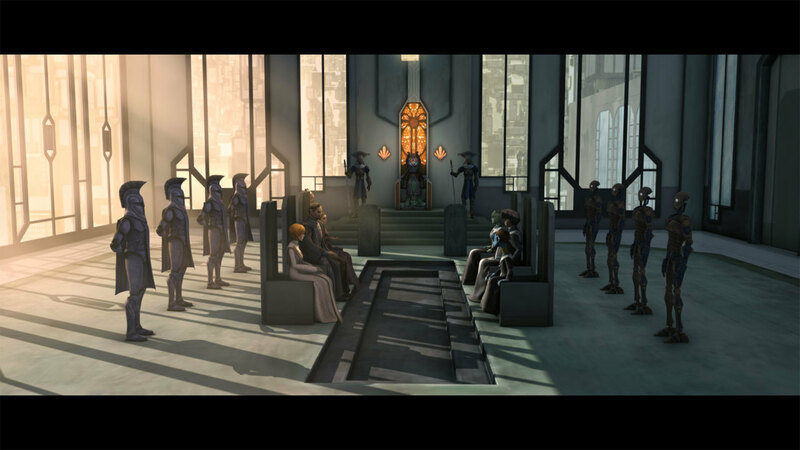 Later though, the war council before attack on Mandalore happened in Vizsla’s tent, but was meant for the leaders and commanders alone, not all “society” of camp. Despite ideological differences, Satine and Pre share similar lack of need for luxury. What I think may be part of their Mandalorian culture - a culture that may be shaped by the old faith in three gods. Both of them do not focus at material goods, do not collect unnecessary things; in case of Pre, we may wonder if it’s due to limited space on ships to carry additional burden, but his previous quarter on Concordia - as far as we know - lacked such stuff too. 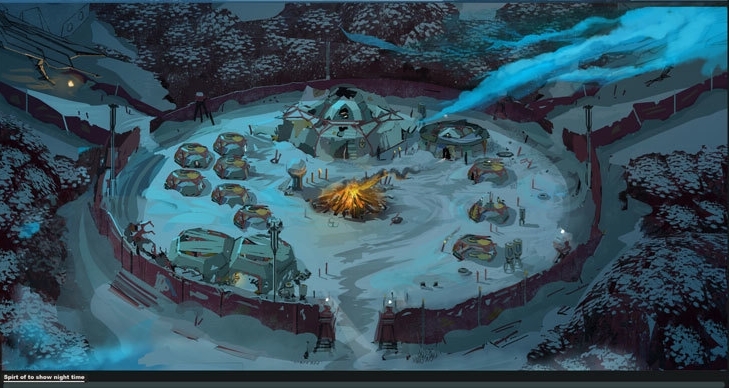 Also, on Carlac, Death Watch could just take over the village and live there in more comfortable conditions yet they choose camping in snowy season/climate. Vizsla and Duchess at the same time use elements that highlight their social & political status in shape of throne and the special seat. 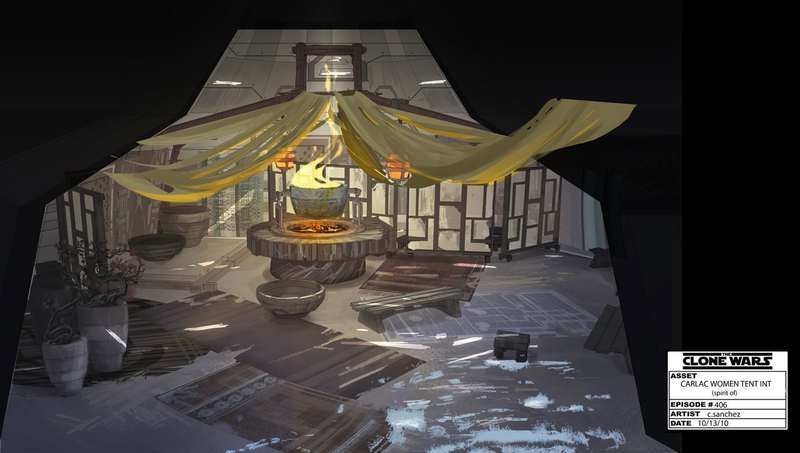 Yet another difference between them is that, Death Watch warriors may use leader’s chair when they (most likely) feel like doing it and are acting freely in his tent (the private space) unless the same place is used for important meetings / war councils. The line between “sacrum” and “profanum” of place is much more blurry and fluid between warriors than with New Mandalorians, where court etiquette is stricter. The other difference is that, Pre (and warriors following him) is on exile and thus forced to endure hardship while Satine lives in her spacious palace and as a ruler of Mandalore, has better access to food, medicine and basic goods, even when Mandalore System get limited access to trade routes thanks to war/Republic politics. Due to Clone Wars and their respective political goals, both travel a lot. Satine mainly to keep Mandalore neutrality intact and to gain allies in her pacifist ideologies. Similar, Pre is travelling to find a powerful allies to take over Mandalore and to find a way how to repay Dooku for his betray, while also Death Watch need to move from place to place for their own security. In case of Vizsla, that means remaking camp on various planet and adapting to new climate/place. About their travels I’m gonna talk soon in part about their personal ships. There is also one aspect I feel like talking about. The Light and Shadows that play, ah, let’s call it a theme for contrast between Satine and Pre. The Duchess lives in spacious, well-lighted Royal Palace, while Pre’s tent is usually enveloped in the dark, which is illuminated by lamps alone. Frankly, I don’t have an idea if that was intended symbolism (pacifism/light/good vs warrior culture/dark/bad) or did it happened naturally. The next parts will be focused at Satine and Pre respective personal ships (Coronet vs Gauntlet), Servants (“household” & guards) and personal wealth (that most likely will covers everything not fitting to previously mentioned categories).